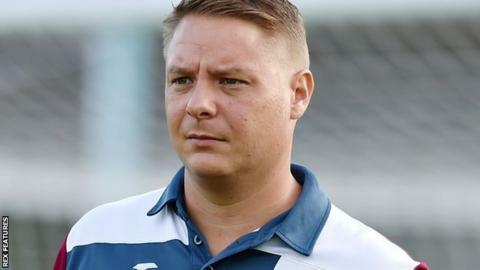 Leigh Robinson has been sacked as manager by Truro City - after just under seven months in charge of the National League South side. Robinson, 37, and assistant Michael Meaker, 47, have both parted company with the relegation-threatened club. Truro are now seeking a third manager of the season, Robinson having come in to replace Lee Hodges on 3 September. City, in 19th, are a place and a point above the drop zone after Saturday's 3-0 home defeat by Chelmsford. Truro lost 14 of Robinson's 28 league matches in charge following his move from seventh-tier side Taunton Town. A club statement said: "The difficult decision has been taken to relieve first-team manager, Leigh Robinson, and assistant manager, Michael Meaker, of their duties with immediate effect. "We thank them for their efforts and wish them well in their future endeavours. "A further statement will be made in due course."